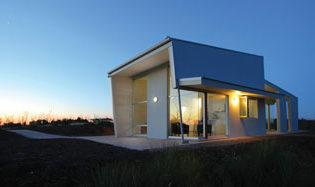 Located near Port Lincoln on the Southern end of the Eyre Peninsula, Tanonga’s Ridge Site Luxury Eco Lodge is the perfect hideaway for nature lovers seeking peace, quiet and a chance to uninterruptedly appreciate the great outdoors. Perched on top of a hill with panoramic views stretching over 500 acres of privately owned property and out to the gleaming ocean beyond, visitors can enjoy the scenery, the thriving bird and wildlife in the area and long walks through the native forest in total solitude. The Tanonga Ridge Site Luxury Eco Lodge is the perfect hideaway for nature lovers seeking peace, quiet and a chance to uninterruptedly appreciate the great outdoors. The lodge is solar-powered, built using natural materials, and designed to have minimum impact on the surrounds. So rest easy: your eco-footprint is kept to a minimum, even while you’re savouring those delicious holiday indulgences, such as a soft, king-sized bed, a glass of wine beside the toasty wood fire, and a steaming soak in the Japanese-style bath. Details // Charlton Gully, Eyre Peninsula, SA. From $320 per night. www.tanonga.com.au, (08) 8684 5066.